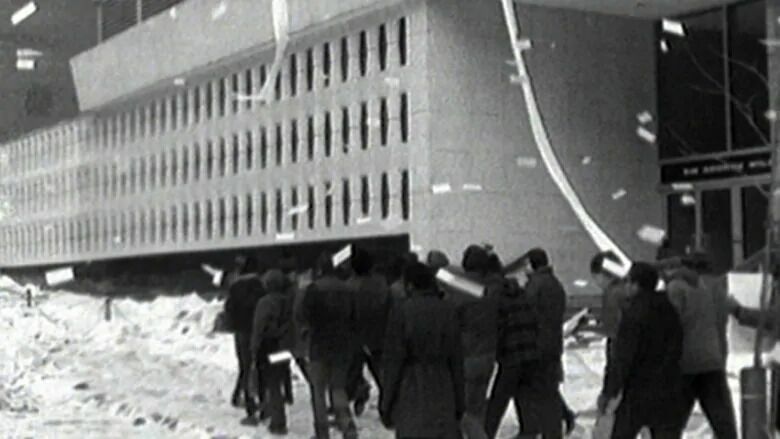 Fifty years ago today, on Jan. 29 1969, the Sir George Williams Affair began—also known as the Concordia Computer Riots. According to CBC, about 200 students occupied the ninth floor computer centre in the Hall building and engaged in a peaceful sit-in protest for 14 days. The occupation was organized following the administration’s mishandling of racism complaints lodged by a group of six students against their biology professor, Perry Anderson, who they accused of unjust grading. Negotiations between the administration and the students fell through on Feb. 11. The peaceful protest turned violent after the administration handed the case over to the police, which resulted in 97 arrests, a mysterious fire and $2 million worth of property damage. Blackout: the Concordia Computer Riots, organized by production company Tableau D’Hôte Theatre, is a play that explores the events that led to the student occupation and questions how race relations have changed in Quebec over the last 50 years. Blackout will essentially explore and interrogate the historical events of the Sir George Williams Affair through fictional characters. Brown said that while they were exploring archived media coverage of the peaceful protests-turned-riots, the team also tried to look at what wasn’t covered. “When you do research on the event, you find images of the destruction and the $2 million of damage,” said Lydia Dubuisson, part of the writing unit for Blackout. “You don’t read about the events that led up to the riot.” Students were blamed for the mysterious fire that started after police got involved. However, according to the CBC, some believe police set the fire as a means to sidebar the protest. In 2014, former Arts and Science Federation of Associations (ASFA) Executive Mei Ling, a pseudonym, filed a complaint against the administration after experiencing sexual and racial discrimination from two ASFA executives. Despite Mei Ling winning the case in 2015 and ASFA supposedly reforming its harassment policies to be more survivor-centric, the Centre for Research-Action on Race Relations (CRARR) filed a sexual harassment complaint in 2018 against then ASFA president, on behalf of Harris Turpin. “I find what these students did to be so remarkable,” said Brown. “Everything we do matters, and the administration tried to tell [the students] otherwise, but they knew better.” Despite the 97 arrests and property damage, the protests led Concordia to revise its policies and procedures, which resulted in the creation of the Ombuds Office, according to CBC. According to Concordia University’s website, “the Ombuds Office’s role is to assist in the informal resolution of concerns and complaints related to the application of university policies, rules and procedures.” It is allegedly independent of all the administrative structures of the university, and impartial. Blackout will show every evening from Jan. 30 to Feb. 10 in the DB Clarke Theatre from 8 p.m. to 10 p.m.